국말 고종의 누비저고리로서 평상복으로 착용하였던 옷이다. 고종은 흥선대원군(興宣大院君) 이하응(李昰應)의 둘째 아들로서, 철종의 뒤를 이어 등극하였다. 본 유물은 고종의 질녀(姪女)인 안동 김씨 김인규(金仁奎) 부인이 입궐하였을 때 왕실에서 하사받은 유물이다. 자적색 운문숙사(熟紗) 겉감과 흰색 명주 안감을 겹쳐 놓은후 0.3~0.5㎝ 간격으로 정교하게 누빈 잔누비[細樓緋] 저고리이다. 잘게 누빈 누빔선에 풀을 칠하여 인두로 다려 마치 골덴직물처럼 입체적인 효과를 보였는데 이러한 누비형태를 오목누비라고 하였다. 고름은 누비지 않았으며 동정은 달려있지 않으나 깃 부분의 누비 간격이 몸판보다 넓고 바느질도 성글게 되어 동정을 달았던 위치로 확인된다. 겉감은 일정한 크기의 작은 운문 사이에 박쥐문으로 되었는데 이와 동일한 문양의 옷감이 고종의 후궁이었던 광화당의 원삼(중요민속자료 제52호)에 부착된 한삼에 사용되어 흥미롭다. 겉깃의 모양은 둥근 반달깃 형태이며 안깃은 목판깃으로 되어 있는 일반적인 저고리 형태이다. 길이는 57.5㎝이며 화장 80.5㎝ 품 49㎝이다. 진동(24.5㎝)에서 수구(20.5㎝)에 이르는 배래선이 완만한 곡선을 보인다. 국말의 왕실유물들이 대부분 예복 중심의 유물들임에 반해 이 옷은 평상복으로 고종이 입었던 옷이라는 점에서 그 의의가 있다. This quilted jeogori (jacket) was worn by King Gojong (1863-1907) as a casual outfit. The second son of Yi Ha-eung, who is also known as Heungseon Daewongun, King Gojong ascended to the throne after King Cheoljong. 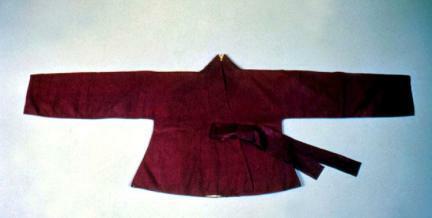 The royal court received this piece of clothing from the wife of Kim In-gyu, who was a nephew of King Gojong. This jacket is made of reddish purple outer cloth with white lining and is quilted intricately with spacing of 0.3~0.5cm. It is treated with glue and subsequently ironed to provide a defining effect like corduroy fabric. This kind of deep quilt stitching is called Omok nubi. The breast ties are not quilted, and there is no collar strip on this jacket; note, however, that the quilts on the lapel area are wider than those on the trunk area, and the stitches are done sparsely, implying that there might have been a collar on the spot. The outer cloth has a pattern of bats between small cloud patterns in uniform style. Interestingly, the same pattern of cloth was used in the making of the hansam attached to the wonsam (ceremonial robe, Important Folklore Material No. 52) owned by Gwanghwadang, who was a royal concubine of King Gojong. 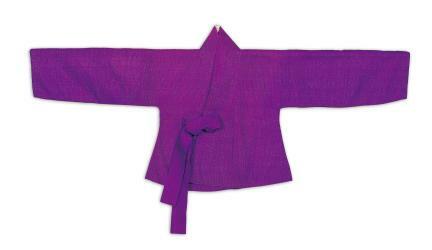 The outer collar has a half-moon shape, whereas the inner collar has a square shape, showing a general jeogori style. The length of the jeogori is 57.5㎝, the sleeve length is 80.5㎝, and the breast width is 49㎝. The sleeve in-seam between the armhole (24.5㎝) and wrist hole (20.5cm) has a gentle curve. This jacket carries great significance as the casual clothing worn by King Gojong, unlike other royal court artifacts that mainly consist of ceremonial robes.